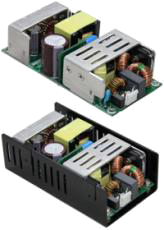 The PSPW150 series of AC/DC power supplies provides 100 Watts of output power with convection cooling and 150 Watts with 12CFM forced airflow. This series consists of 12V, 15V, 19V, 24V, 28V, and 48VDC single output models with a 90-264VAC full range input which enables them to be used anywhere in the world. These supplies also feature a high efficiency up to 85% and a power factor > 0.9 at 115/230VAC. These supplies are also protected against short circuit, over voltage, and over load conditions. The PSPW150 series has UL60950-1, CSA-C22.2 NO.950-1, Nemko EN60950-1, and CB IEC60950-1 safety approvals. This series is also CE marked and meets EN55022 Class B, CISPR22 Class B, and FCC Part 15 Class B EMC standards. Both open frame and U-chassis mechanical options are available for this series. Notes: 1. There are two types of mechanical options available for this series. The suffix on the end of the model number indicates the package type. The suffix "-O" is for open frame type and the suffix "-U" is for U-chassis type. 2. 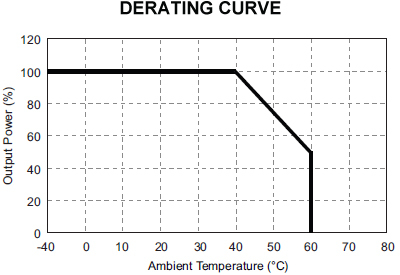 The output power and output current values listed in the table on the "Models" tab is the maximum value with 12CFM forced air. 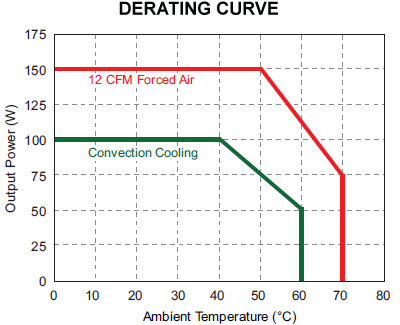 For convection cooling values pease see the data sheet.